With over 40 years experience, Confederation Freezers offer warehousing solutions coast to coast throughout Canada and the United States. Warehousing services are available 24 hours a day, 7 days a week and we have a variety of leasing options including space within our cold storage buildings, dedicated managed facilities, truck parking and office rentals are available. We understand that storage timing can be unpredictable, which is why we provide flexible renewal periods for businesses with irregular shipping and storage schedules. Confederation Freezers is a CFIA recognized product recall facility and can work with you to track, pickup and store affected products for inspection and detention. 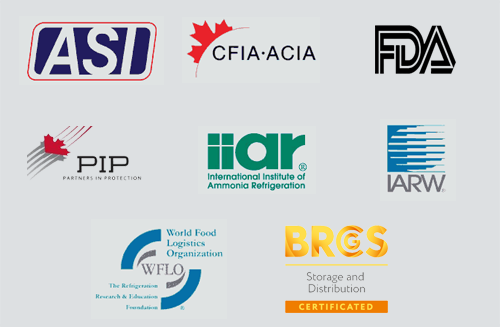 As a leader in the storage industry, Confederation Freezers hold memberships with key industry associations and all relevant industry certifications. Confederation Freezers employ cutting edge technology solutions (EDI, RF, Web Access etc.) to provide best in-class warehousing and transportation services and is committed to operating in an environmentally friendly and sustainable way. Confederation Freezers offer customizable temperature solutions to meet all your needs from Frozen to Dry Storage (-40 °C/F to +2°C/ +65F), the greatest range offered in the industry. This customizable range allows us to store products ranging from ice cream to confectionary and everything in between. You can rest assured that each of our warehouses are monitored 24-hours per day, guaranteeing safety and security for your products. We offer bulk ingredient and finished goods storage and handling; including totes, drums, cases, pails and “eaches”. Everything is handled with the utmost care as we treat it like we own it. Our strict storage and handling controls also allow us to be Allergen, Halal, Organic and Kosher capable. Confederation Freezers is also qualified to accept various sized loads ranging from full truck loads, single pallets to case quantities. All Confederation Freezers' storage locations are Canadian Food Inspection Agency certified. All facilities are HACCP, WHMIS and PIP recognized, as well as USDA registered. In addition, premises are audited annually by Maximum Labs PIP. 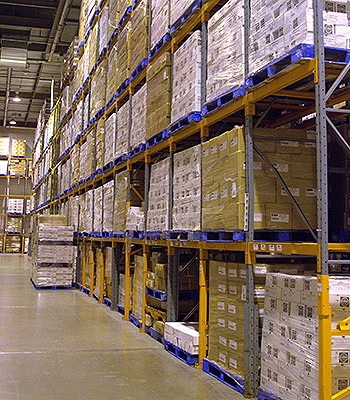 In addition to our Core Warehouse Solutions we offer a full range of transportation and a number of specialized services. Confederation Freezers offers exceptional service and competitive rates. Contact us for more information.